This is a page of admittedly self indulgent nostalgia. They go way back to my teens and the place where I started out on my career as a photographer - Charlton Athletic Football Club in south east London U.K. As a teenager with my first SLR camera I was pushy enough to get the chance to photograph "my team" - as well as the rivals "down the road" at Millwall and Crystal Palace. Most of these pics appeared either in the South London Press, the Lewisham Mercury, the Kent Messenger, the (long defunct) Lewisham Borough News, or the Charlton match day program. Thereafter shifted base from London to Cairns Australia. 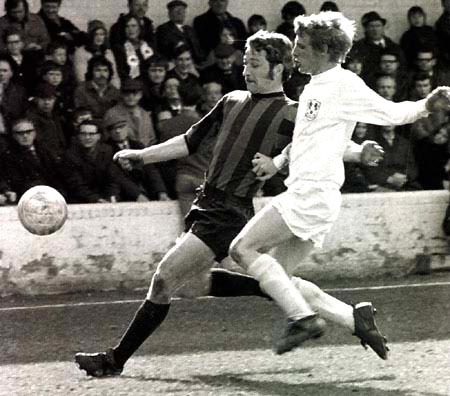 Charltons Ray Treacy heads powerfully past Orients Dennis Rofe in the away fixture on 2nd October 1971. Charlton lost 2-3. (Above) Charltons Arthur Horsfield shows some "innovative" tactics in the game at the Valley against Blackburn Rovers on the 24th March 1973. A bit of shirt pulling in the top shot and juggling in the lower. But Arthur could score goals too! 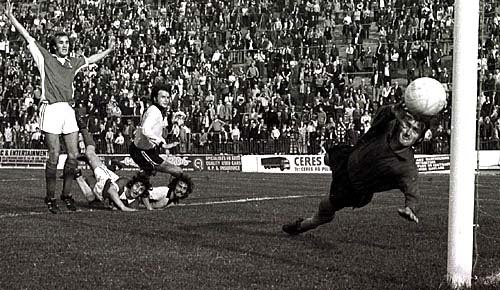 (Below) Arthur (on the ground) watches his header beat Watford keeper Andy Rankin for Charltons second and winning goal - 1st of October 1972. Then Arthur (with help from Paul Davies, left) salutes the terraces, in the second shot. 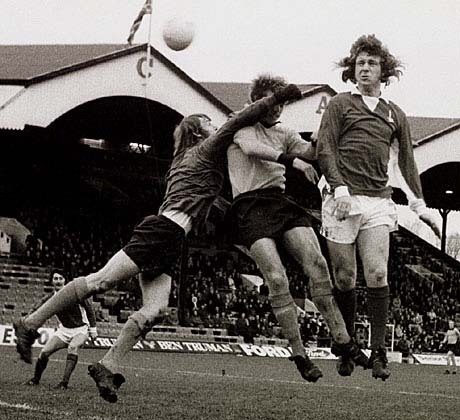 Charlton have had countless tussles with local rivals Millwall over the years, including this clash at the Den in March 1971. (Below) Charltons Peter Reeves beats off the challenge of Millwalls Eamon Dunphy - but Millwall won the match 2-0. 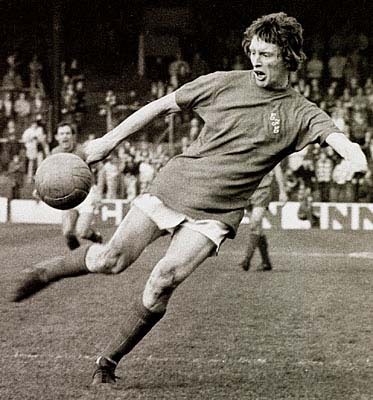 One of Charlton greatest club stalwarts was Keith Peacock. In the pic below - Keith gets in a bullet of a shot in the game against Tranmere at the Valley on the 5th November 1972. The score - 1 -1. Derek Hales top scored for Charlton in six out of his eleven seasons with the club. 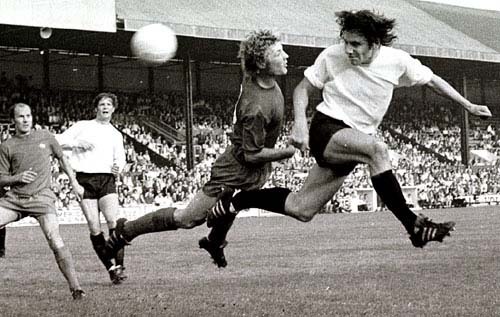 One of his early goals for the club was this shot (above) which flew into the net for Charltons first of three goals against Rochedale at the Valley on October 20th 1973. 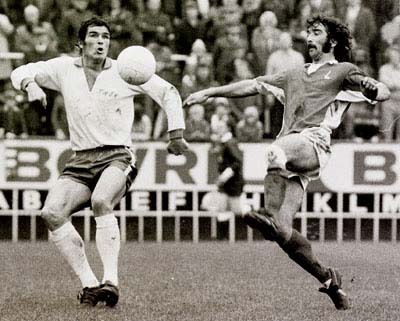 In the other pic ( below) Hales tussles with the legend Ron Yeats in the game against Tranmere at the Valley, October 6th 1973. Mike Flanagan gives Charlton an 8th. minute lead over Port Vale (below) at the Valley on 02.12.72. Vales Summerscale made sure Charlton got both points when he slotted the ball into his own net. 2-0. 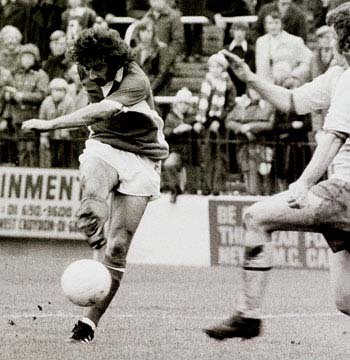 Dickie Plumb (above) during Charltons 3-1 home win over Swindon on 18.03.72. 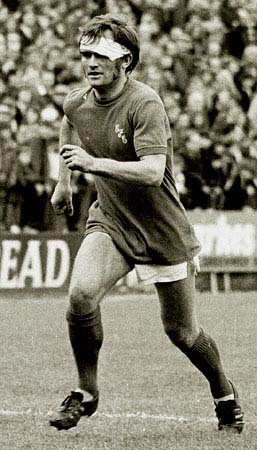 Plumb scored 10 goals in 36 appearances during his spell at the club from 1970-1972. 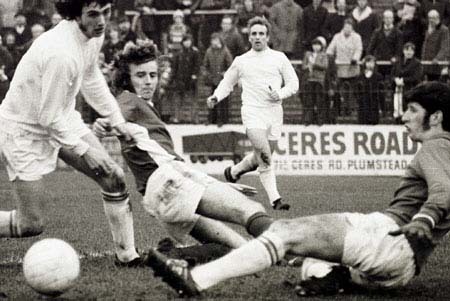 In the days before multiple substitutes Bobby Hunt (right) battles on with a head wound in Charltons 1-2 home loss to Orient on 31.03.72. 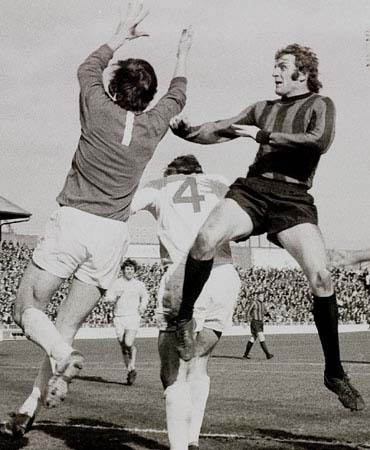 The Chesterfield keeper (below) gets a lift from his defender in order to thwart Charlton striker Arthur Horsfield during the 3-3 draw at the Valley on 22.09.73. 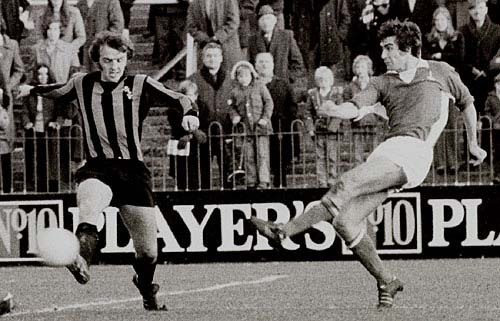 Former Swindon Town hero Roger Smart (above) smacks home his first and only goal in a Charlton shirt in the 2-0 win over Plymouth at the Valley on 17.11.73. 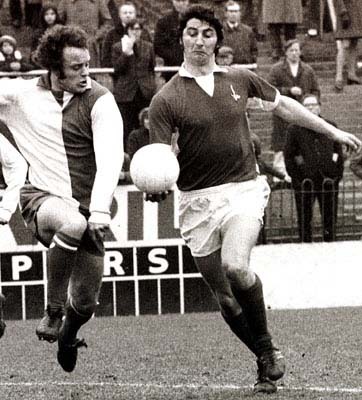 Charlton have had many battles with neighbours Millwall and lost 2-0 in this fixture at the Den on 27.03.71. 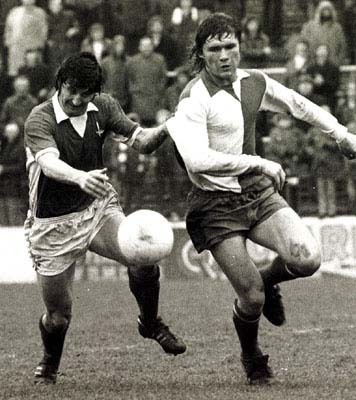 The Charlton player in the unusual horizontal stripes below is Barry Endean. 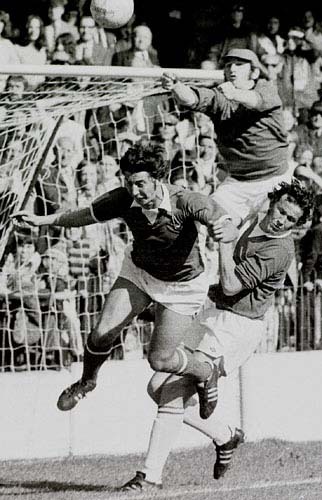 Keith Peacock (below) played for the "Addicks" for 17 seasons spanning 1962 - 1979. 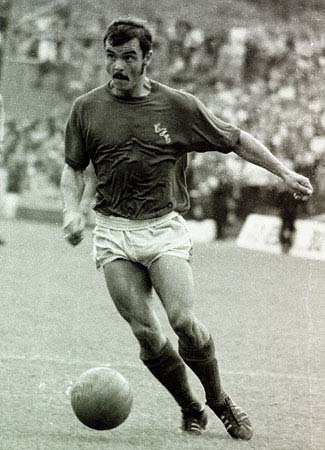 He scored 107 goals in 567 appearances. The goal he is scoring (above) - an 85th minute equaliser in the 1-1 draw against Portsmouth on 22.04.72. - gave Charlton hope that they could avoid relegation that year. However, that hope was short lived - they finished second from bottom and were relegated to division three.